© Daniel Libeskind. Photograph by R. H. Hensleigh and Tim Thayer. 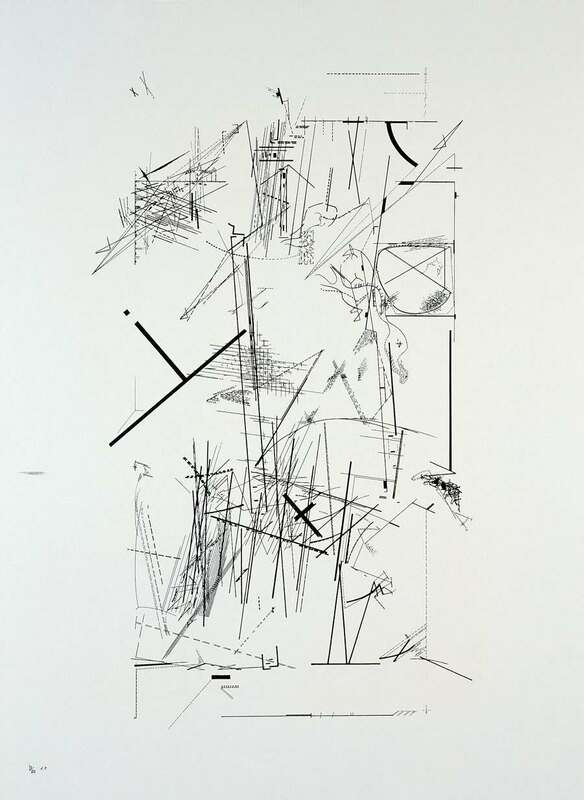 Chamber Works is one of a number of suites of drawings and prints created by Daniel Libeskind during his tenure as CAA architect-in-residence from 1978-1985. These works took the architectural community by storm in the early 1980s. In the precise and inhospitable spaces of Libeskind’s drawings, many architects and critics (John Hejduk, Aldo Rossi, Hal Foster, Alvin Boyarsky, and Juhani Pallasmaa) saw the promise of a third path for architecture—an alternative to neo-avant garde modernism, with its overtones of mastery and dogma, and to the shoddy irony of postmodernism. Although Libeskind’s drawings did not represent or specify constructible spaces, they were immediately understood as the sign and spirit of a possible architecture. Libeskind’s drawings were read as pure notations, resembling those of avant garde composers. Not only is the title a reference to music, but the folio of twenty-eight prints, published by the Architectural Association, was packaged like a boxed set of LPs. Libeskind’s marks call to mind associations that are also painterly, historical and scientific. His melancholy drawings seem to represent the scrap heap of modern culture.